When renting a dumpster in the Philadelphia area, trust your business to a family owned and operated company that has been providing great service to our customers since 1992. We provide waste removal services for the entire Tri-State area. We provide the highest quality service, fast delivery, and the lowest rates. For prompt service & reasonable rates let Geppert Recycling handle your waste disposal needs. With over 20 years of experience, the largest variety of dumpster sizes and strong customer service skills, our dumpster rental company services Philadelphia, Montgomery, Bucks, Chester, Delaware counties in Philadelphia and select areas in New Jersey and Delaware. 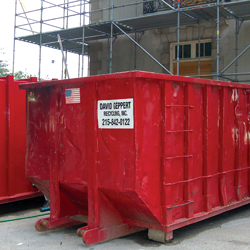 Call Geppert at 215-842-0122 today to rent your dumpster today! Most solid, non-hazardous materials are acceptable. Household debris – carpet, furniture, mattresses, laminate, tile or vinyl flooring; bath fixtures, such as tubs, showers, sinks and toilets. Construction debris – concrete, cement, masonry, wood, metal, insulation, drywall, roof shingles, glass. Recyclables – wood, paper, cardboard, scrap metal, asphalt, concrete. Toxic or hazardous waste, including biomedical or infectious waste; flammable, explosive, chemical materials; pesticides, solvents, paints (except latex paint that is completely dried to solid); aerosol cans or propane tanks; motor oils, lubricants, antifreeze, refrigerants; tires, batteries, microwaves, televisions, computers, fluorescent tubes. All liquids are prohibited. Note: This list is not exhaustive, and Geppert Recycling maintains the right to refuse any materials that are deemed unacceptable. The dumpster can hold a certain volume of material, weighing more or less depending on the materials. Materials such as concrete or masonry are heavier than paper or cardboard, but take up the same volume in the dumpster. Our terms and conditions require that the dumpster is not filled above the fill line. If your dumpster goes over the tonnage included in your contract, you will be charged an overage. We have several pricing options available to help reduce unexpected charges. Typical rental period is 7 days; however, we will work with you on terms that meet your project requirements. Dumpsters may damage your driveway, depending on many factors. Customer assumes all liability for damage to private driveway surfaces. We recommend that you protect your driveway with plywood and consult with your local municipality regarding your responsibility to repair damage to sidewalks caused by construction related services. Dumpsters can sit on a driveway or the street. Please check with your local municipality regarding the regulations and the permit requirements. Customer will ensure that the driver has unobstructed access to deliver the dumpster to specified area. Permits may be required. Please check with your local municipality. It is the consumer’s responsibility to obtain and pay for necessary permits and to have them prior to dumpster delivery. No refunds will be issued for delays caused by non-compliance. Fines for non-compliance with local ordinances are the responsibility of the consumer.